We here at On Sandwiches have never made any bones about our deep and abiding lovefor the pulled pork sandwich. In August, we are showcasing some of our recent pulled pork experiences and seeing how they stack up against one another, and against our idea of what a pulled pork sandwich should be. We visited Dave’s Chillin’ and Grillin’ not too long ago and tried one of his unorthodox daily specials. The pulled pork at Dave’s is another daily special, made once per week. Dave slow-cooks the pork in-house for hours before adding to it his homemade bourbon barbecue sauce and spicy slaw. The week I stopped by for a pulled pork sandwich, the bourbon of choice was Wild Turkey. The sandwich was very tasty, but really wasn’t exemplary of what a pulled pork sandwich can be. I feel that, if you’re going to the trouble to get up well before sunrise and make your pork in-house, you should really let the pork itself be the star of the show. Unlike some eateries, you can have bragging rights. “Hey, you like that pork? I made it with my own two hands.” I have first-hand knowledge that there really is nothing like pulled pork that has been made with care. The spicy slaw and the bourbon sauce were good, and either one on a sandwich would be a lovely grace note. You pair both of these strong flavors with the pulled pork, and the sauces become the star of the show. That’s all well and good, but that isn’t what a pulled pork sandwich should strive to be. Dave is a fan of his spice, as we found with the Surf and Turf. Sometimes it works in his favor, sometimes it works against the sandwich, and sometimes, like with the pulled pork, you have a perfectly acceptable sandwich that perhaps falls short of its potential. 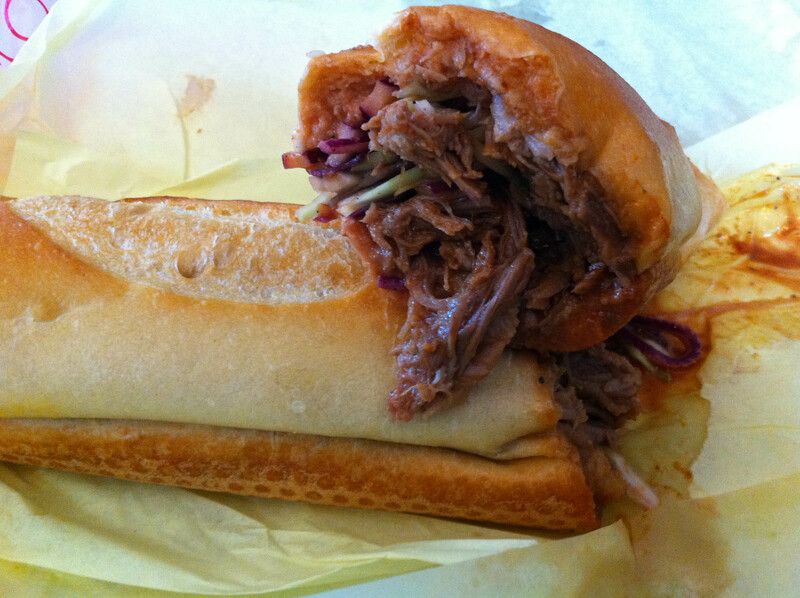 This entry was posted in General Sandwich Discussion, Sandwich Reviews and tagged Los Angeles, Pork, Pulled Porkstravaganza, Reviews by Bill, Sandwiches I Have Eaten by bengrimm. Bookmark the permalink.